In a book filled with many winners, David Lebovitz’s My Paris Kitchen seldom disappoints. Working my way through the entire book with my friends from Cook the Book Fridays is a mostly delicious adventure. Each recipe offers a new technique, a new flavor combination, or a new twist on an old favorite. There’s something new to learn with every challenge. The name of this week’s recipe Buckwheat Rolls with Seaweed Butter is tantalizingly exotic. 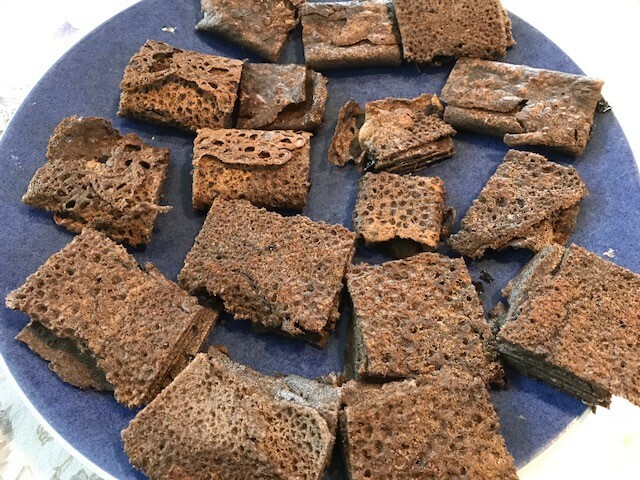 The buckwheat galettes provide a foundation of French-ness for an Asian compound butter made with seaweed sheets, aka nori. It isn’t a difficult recipe. 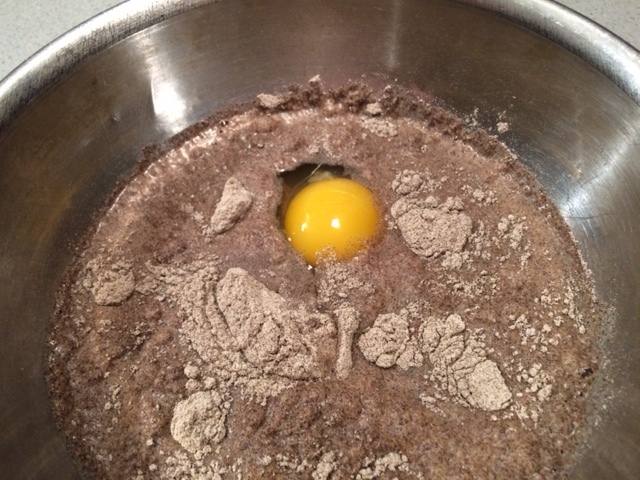 Mixing the batter for the galettes (or savory crêpes) needs no special equipment beyond a bowl and a whisk. Cooking the galettes is a bit tricky, but I was more successful this time than when we made the buckwheat crêpes with ham, cheese, and egg last year. For the seaweed butter, I used some Trader Joe’s roasted seaweed snacks I had on-hand. They toast up easily with a few waves over a gas flame before being mashed into softened butter. The most difficult part was spreading the butter onto the galettes before rolling them in preparation for a final crisping in the pan. Once crisped on both sides, the rolls are sliced into bite-sized pieces for nibbling. The verdict: Ick! This was a flop. Neither Howard or I liked these at all. They had so much potential, but despite the interesting list of ingredients, they were rather tasteless. We didn’t even finish them. Boo! On the positive side, this is only the second recipe we’ve made from this book that I consider to be a failure (the other one was Panisse Puffs). And so, I look forward to the next recipe the group takes on. I’ll bet that my Cook the Book Fridays friends enjoyed this more than we did, so you can check out their links here. As someone who enjoys food holidays, or celebrating any holiday that can be interpreted through food, Bastille Day is marked on the calendar as a night for a French dinner. 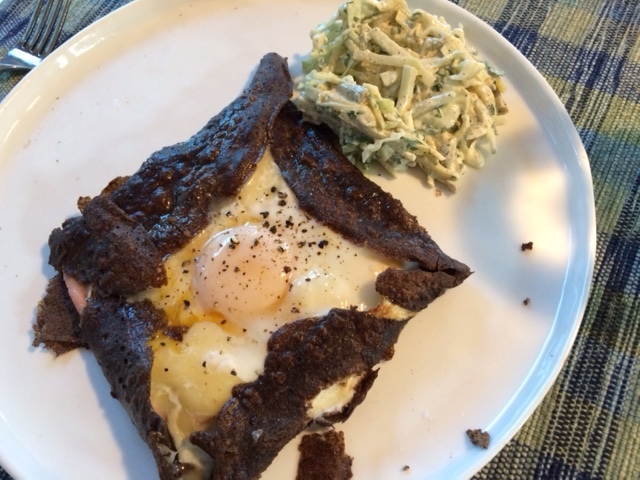 This week’s recipe for Cook the Book Fridays, Galettes Complètes (Buckwheat Crêpes with Ham, Cheese, and Egg), were a natural to mark the event. What I didn’t anticipate was the news that came in as I was preparing the crepes. Another brutal attack on innocent people. France was hit again as the people in Nice celebrated their national holiday. The news is too often filled with stories of terror, hate, and intolerance of others. Civilization isn’t acting very civilized these days. It makes me really sad, and afraid for the world’s future. Some days I feel like things are spinning out of control and that the vision of a peaceful world is very far out of reach. When the world feels upside down, my first instinct is to cook. Being in the middle of cooking these galettes gave me a connection to France. I’m also reading The Only Street in Paris by Elaine Sciolino which I won in the giveaway on Mardi’s site Eat.Live.Travel.Write. I mixed up the batter for the buckwheat pancakes the night before, then cooked the crepes in the afternoon. The recipe said it yielded 12 crepes, so I made half a batch. 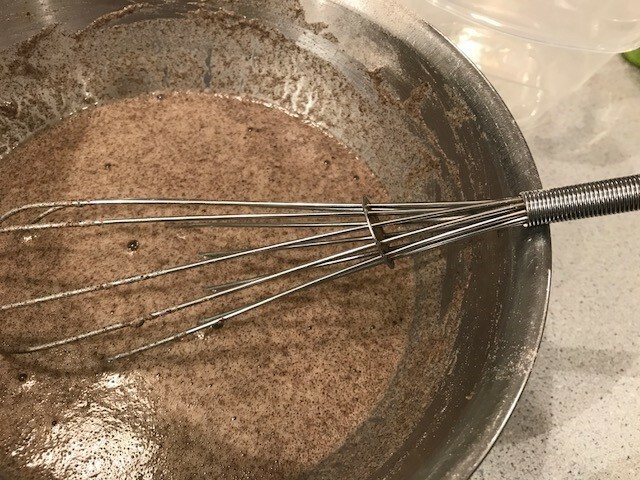 I neglected to check the tips from my other friends at Cook the Book Fridays where they were recommending using more batter for each crepe, making it easier to fully coat the pan. 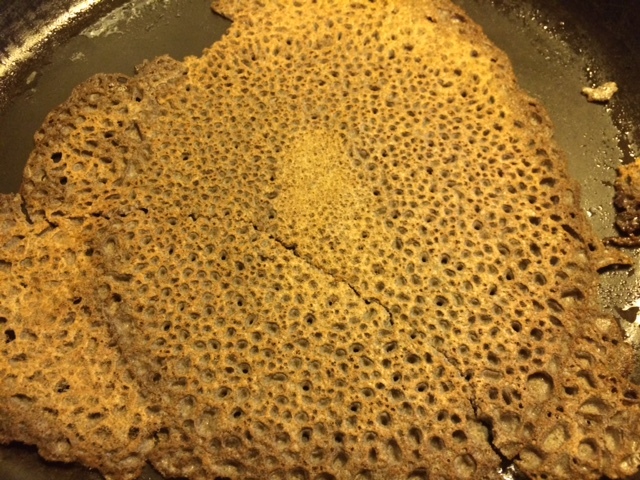 I still haven’t gotten the hang of making crepes. Using a bit more batter, I was able to make 5 crepes, but 3 of them tore and one was small. I should have made a full batch of batter to compensate for the high rate of error. Remarkably, my first one, normally the “practice” one, came out the best. 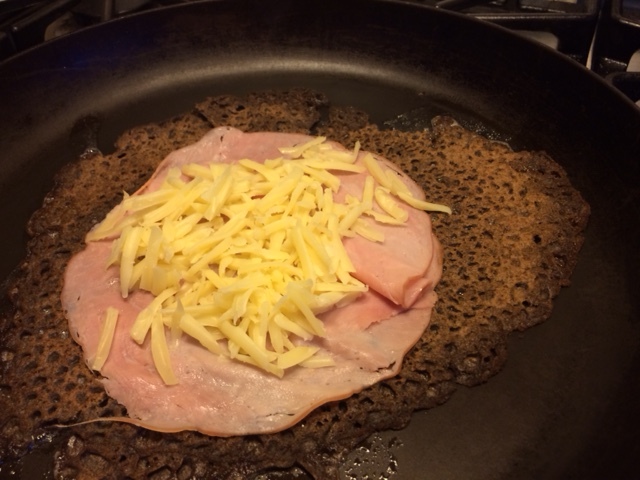 The crepes are returned to the pan and topped with sliced ham, grated Emmenthal cheese, and an egg, then covered. While the cheese melts, the egg cooks. It took a while for the white to firm up, but eventually it did. The final touch is to fold the edges up over the toppings to form a square. Seemingly simple, I actually had a hard time getting the sides to stay up. 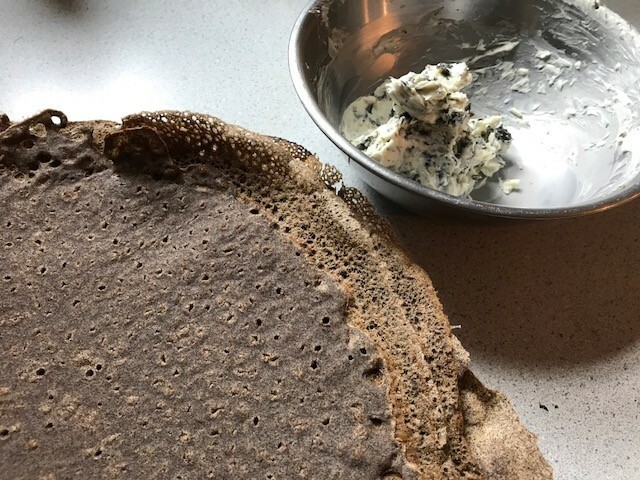 The buckwheat crepes are considered street food in their native Brittany. I’m not really sure how one would eat these on the street, but they would definitely satisfy an urge for a snack that’s savory, salty, and filling. They make a nice centerpiece for a light summer dinner too, on a plate with a fork. I liked the crepes. Howard liked them too, but thought he’d prefer regular crepes to the buckwheat. In the end, I’m not sure they were worth the effort. I served the crepes with another batch of raw vegetable slaw with garlicky dressing (the creamy version). It was equally as good as the one I made with vinaigrette. For dessert, we continue the French theme with the last slices of Dorie Greenspan’s Cherry Crumb Tart (from Baking Chez Moi). To see how others’ crepes came out, check out their links here. If you want to try them, the recipe can be found on page 135 of David Lebovitz’s My Paris Kitchen. 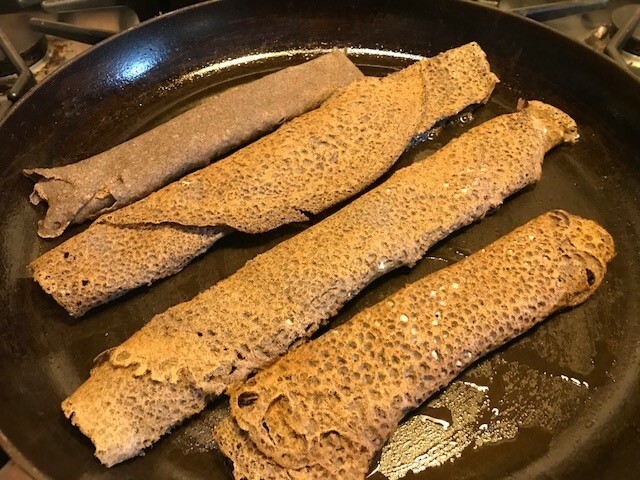 Here’s David’s story about these crepes (though no recipe). Be sure to smile at your neighbor or better yet, a stranger, and take a small step in making small connections to spread friendship and warm feelings instead of hatred in your corner of the world. In these tumultuous times, I wish you peace.